Meet my good friend, Nurse Chapel. She and I go way back together. 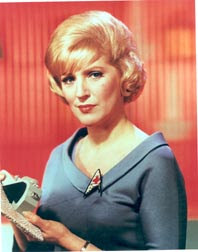 I watched her on Star Trek every Friday night when I was a kid, and she was the one who convinced me to become a nurse. Nurse Chapel was my idol. I thought it was really cool that she worked on a spaceship. Did you know that Nurse Chapel is a big fan of Change of Shift? The latest edition of CoS is up at Emergiblog. Beam up and check it out. Just wanted to say how much I enjoy reading your blog. Thanks. Nurse Chapel later became a doctor!